James Otten Dentistry can give you a beautiful smile in Lawrence! With sweet treats seemingly omnipresent this time of year, it is hard to keep yourself – including your teeth – healthy. Don’t skimp on your routine. Shopping, attending parties, wrapping, cooking, traveling … ’tis the season to be crazy busy! But don’t neglect things like brushing your teeth at least twice a day, flossing and visiting the dentist for one of your annual hygiene appointments, if necessary. These small things will help keep your mouth healthy in December and into the new year. Choose healthy foods. Cookies and sweets are delicious holiday treats, but instead of reaching for another candy cane or iced sugar cookie, choose fruits and vegetables instead. Drink water. Running around this holiday season may zap you of energy, but if you want to keep your teeth healthy, try to avoid drinking sodas, sports drinks and juices that are loaded with sugar. After Christmas, the red wine may be flowing at New Year’s parties. 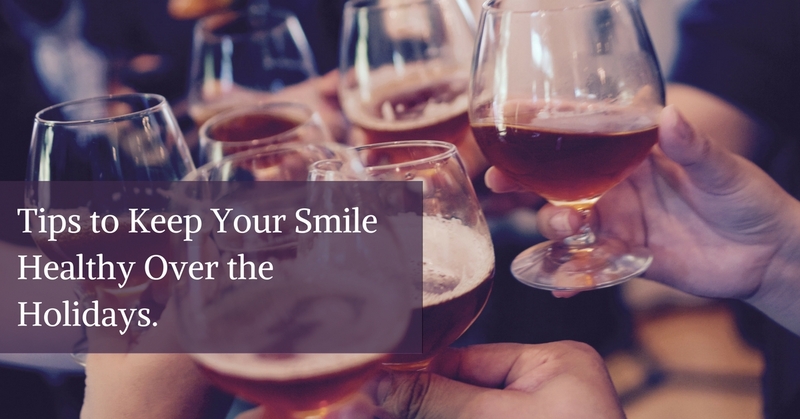 But red wine and other dark-colored drinks can stain your teeth. Instead of these drinks, choose water with fluoride in it to keep your teeth strong, healthy and white. Don’t be a nutcracker. Nuts are good for you, but it’s not a good idea to shell them with your teeth. The hard surface of most nutshells can cause major tooth and gum damage, and can even crack your teeth. Your best bet is to shell the nuts before putting them in your mouth. Skip the chewy, hard candies. Holiday candies like caramels and taffy can cling to tooth enamel, which promotes tooth decay, and may also pull out fillings. Crunching hard candy like candy canes can result in chipped or cracked teeth, which are painful and costly to treat. Avoid sticky, hard treats this time of year and always. With just a bit of caution and care, you can avoid damage to your most important asset this holiday season – your smile. If you do run into tooth trouble over the holidays, James Otten Dentistry is here for you. We can give you a beautiful smile in Lawrence! Contact the office of Dr. James Otten at 785.843.6404 for all your dental needs or to set up a hygiene appointment today. James Otten Dentistry wishes you and your family a happy holiday season! We appreciate our patients and are always here for you and your dental needs, during the holidays and all year round. If you love us as much as we love you, please recommend us to a friend or family member in 2018! For beautiful smiles in Lawrence, trust James Otten Dentistry.